Designing ⋆ 100% Private Proxies - Fast, Anonymous, Quality, Unlimited USA Private Proxy! 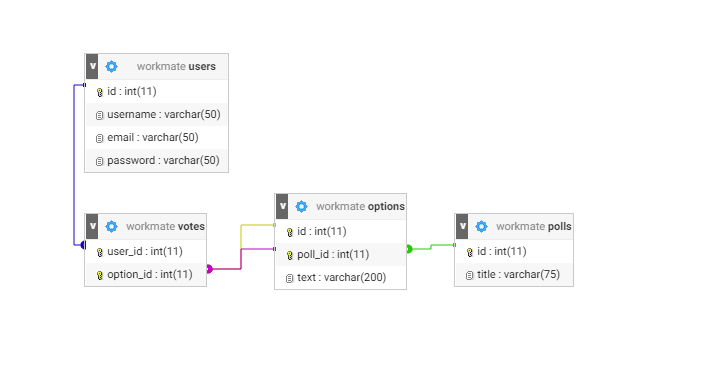 So I designed database relationships for a voting/polling application. I want a user to only be able to pick 1 option on a poll. I want multiple options per poll. So what I have here is this. So how does this look? I have set up these tables and I can insert records for polls, options and users but when I want to add a vote the options I get are not what I expected. I want to add a vote per poll where I can pick exactly 1 option. This is my first time designing a database, any help would be great. For each of these steps, validation is done to ensure that the data is legitimate input before continuing. At the end of the registration, there is a ‘register now’ kind of button to officially register. I want to split the implementation between an API and a frontend. Now I want to make sure that the customer doesn’t bypass registration steps in the frontend (that include validation) and calls the final API call by itself to get the benefit without having bought the product. The second option would allow me to provide the meta data of the field, like binary length or allowed values, but these could potentially be also retrieved from the parser by a method, if necessary. So the question is, what would be the prefered way to retrieve data from a message, which is dynamically created and has fields that can be present or not?Has anyone had any expirience with something like that? Any thoughts and insight would be appreciated. I’m just after a bit of advice really. I have programmed a script in Python that downloads market data from an API, and then does various bits of analysis and spits out some tables and charts displaying this analysis. There are a couple of user inputs required such as time frame or market they want to analyse, but generally the script itself is quite straight forward. My question is how to set up a website, and what would be required for users to basically be able to use my script, but via the website. I actually only want the script itself to run every 15 minutes say, to update the data, and then the user can decide what bits they want to look at. I’m not after a full blown answer, more just guidance as to what would be required and any good tutorials if anyone knows of any, or even just the right thing to start googling, or a service that would be able to cater for this. I have absolutely zero HTML/CSS knowledge, and a decent understanding of python. FWIW. I am facing a design problem related to the design of the user notification messages to be used in a web application. Just for the record, I am working in a JS environment and use a json structure to store user notification messages. However, I think the actual tech stack I use is of no importance here, since this is more of a high level software design problem. on success: “Book created successfully” / “User created successfully” / “Car created successfully” / etc. on error: “Could not create book” / “Could not create user” / “Could not create car” / etc. Furthermore, if entities are added / changed, new messages need to be added; or, even worse, if the success message for instance is changed, it needs to be changed for every entity (book / user / car / etc.). Adding to this i18n aspects, maintainability becomes problematic. I could cobble together some JS string interpolation to make the solution a bit more flexible, but I’m not sure that is the best approach. Of course, the examples are a bit trivial and contrived, but I think they illustrate what I’m trying to express. How can one approach this design problem? I’m designing an NPC that is meant to be a manager/mentor to the players. Contrary to the archetype I’ve just invoked by mentioning Gandalf, she isn’t some divine force incarnate-she’s just somewhat stronger and more experienced than the other players. Since I’m new, how should I ‘design’ this NPC? Do I write stats for her the same way I would a player? If the players are starting out as level 1, what is an appropriate range of strength for her that while she can help the players against tougher threats, she also can’t hold back the tide by herself? The NPC starts out as the person coordinating operations for the NGO the players are working for. She’s strong enough that local militaries need to account for neutralizing her in their tactical planning and politicians in their policy making. The players will eventually become strong enough to challenge her if the storyline goes in that direction. So I am debating what approach to follow. My scenario is : Will receive a POJO which I need to validate ( REST end point ) Now I can explicitly validate specific fields ( which I know / are stated in requirements that they are mandatory ) OR should I define the fields in a db table and define which are mandatory vs not and then read this table one time and then based on what is configured in db drive my validations . What exactly does it mean to be designing within a grid? I’m new to Sketch (app) and am looking to learn how to use the application. 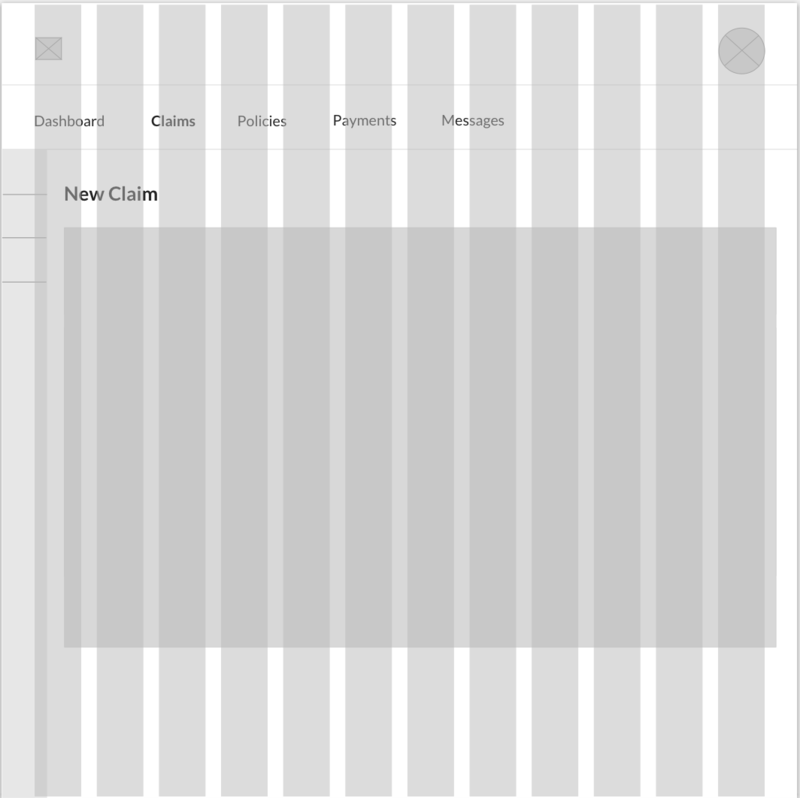 Currently, I’m designing a web application however I’m struggling to understand how one designs within the grid. For example, if in my application, I’d like to have a menu on the left-hand side and that appears outside of the grid suggested in Sketch, what does that mean?I’ve added an image if my question doesn’t make sense, I’m struggling to articulate this well. Thank you! I am a beginner in website design, I only had experience with Github pages design, however, I am not satisfied with the imported templates design. I would like to do my own design and I dont know how I should start. I do prefer using opensource coding and not using wix or others ready templates. I would like to have an advice from where I should start.